Decorative plants can be grown almost anywhere and when placed around the yard, can make the home environment more pleasant. Likewise, decorative plants grown in a pot can also beautify the interior of a home. Nowadays, people are starting to look more closely at plants that absorb air pollution. Such plants offer double benefits: Apart from decorating a room, they also absorb poisonous substances that circulate in air. According to the National Aeronautics and Space Administration (NASA)'s Report on Interior Plants for Indoor Air Pollution Abatement, there are as many as 29 varieties of decorative plants that are able to absorb pollution from the air. "The best plants for absorbing poisons can be placed inside the home," said Saiful Sulun, an agricultural researcher from the Winasari Garden in Bogor, West Java. According to environmentalists who cultivate decorative plants, small trees and shrubs that function as absorbents of air pollution are suitably placed inside the home or office. Likewise, in areas where people smoke. Saiful, who was a speaker in a discussion on the properties of decorative plants at the 2008 Flora Exhibition, which was held at Banteng Field, Jakarta, in August, said there were some varieties of decorative plant that could be used as anti-pollution plants around the home. Among them are the yellow palm (Chrysalindocarpus lutescens) the Paris lily (Cholorophyllum clevelandii), blanceng, or Chinese evergreen (Araceae), sirih gading (Scindapsus aureus), lidah buaya (Aloe vera) and lidah mertua, or sansieveira (Sansieviera trivasciata). 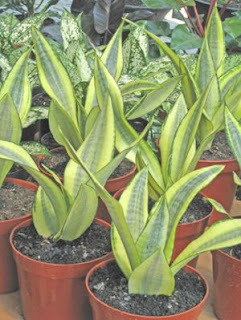 It has been proven that the lidah mertua (translated as "mother-in-law's tongue") plant, for example, has a special ability to neutralize polluted air: According to research conducted by NASA, the leaves of the lidah mertua are able to absorb formaldehyde at the rate of 0.938 grams/hour. In a room measuring 75 square meters, for example, only four leaves of an adult sansieviera plant are required to keep the room free of pollutants. Formaldehyde is a colorless gas that inhibits breathing. It can come from the smoke of burning forests, and the fumes from vehicle exhaust systems and cigarette smoke. This dangerous gas is often used to preserve dead bodies, as a preservative in paint, an ingredient in cosmetics and medicines, and in timber processing. The Paris lily and yellow palm are beneficial in absorbing carbon monoxide, a major air pollutant. This dangerous substance, which is produced from vehicle and factory emissions, is one of the principal gasses causing global warming. Yellow palm varieties are known to be particularly useful as pollutant absorbers, as they are able to produce as much as one liter of water vapor in 24 hours, which allows this plant to soak up a larger volume of poisonous gasses. The aglaonema plant (Aglaonema brevispathan) can also absorb formaldehyde and benzena. Benzena is a dangerous chemical compound that is found oil, fuel and cigarette smoke, which can cause vomiting and headaches in humans when exposed to high doses. Saiful said decorative plants have the special ability of absorbing poisons, while being easy to maintain. The plants can be placed inside a room, but can also be moved outdoors. "They have to be routinely looked after and get exposure to sunshine. That's why pot plants kept inside the home should be regularly put outside to sunbathe every two or three days," she said. Saiful suggested alternating potted plants of the same variety, so that when one is sunbathing, a replacement is still present in the home. Organic fertilizers or compost can be used to maintain plant health. In the plant trade, decorative plants and varieties of anti-pollutant plants are easily found. Prices vary depending on the plant varieties, their age and their features, such as the form of their leaves and colors. At the Flora and Fauna 2008 Exhibition, a medium-size potted sansieviera plant was priced from between Rp 15,000 to Rp 50,000 (US$1.50 to $5). Meanwhile, aglaonema seedlings were priced at around Rp 25,000 ($2.50) per punnet. Apart from making rooms more beautiful, it is clear that some decorative plants have other benefits. By using plants to absorb gases and pollutants in the home, an environment can be created that offers fresher, healthier air to breathe.